Recently Mount Ousley Public School was recognised by the NSW Department of Education and named as the state’s Digital Lighthouse School at the inaugural Technology 4 Learning (T4L) Awards for its K-6 comprehensive, cross-curriculum implementation of digital learning. It’s a great acknowledgment that reflects many years of carefully planned and implement strategies by the entire staff, but especially Principal Peter Holmes and the leadership team of which I have been fortunate to have been a part of. This amazing three-minute video showcases a futures focussed school and what can be achieved when leaders, staff, parents, and students join together to engage in contemporary education. It is also so much more, Mt Ousley PS is what I would consider a futures focussed school, of which digital technologies are just one essential component of the teaching and learning. Trust – a trusting culture; staff are trusted to deliver quality teaching and learning programs, students are trusted and supported by their teacher to make learning choices, the parent community is supportive of school plans and directions. Doors are open, visitors are frequent and accountability is transparent. 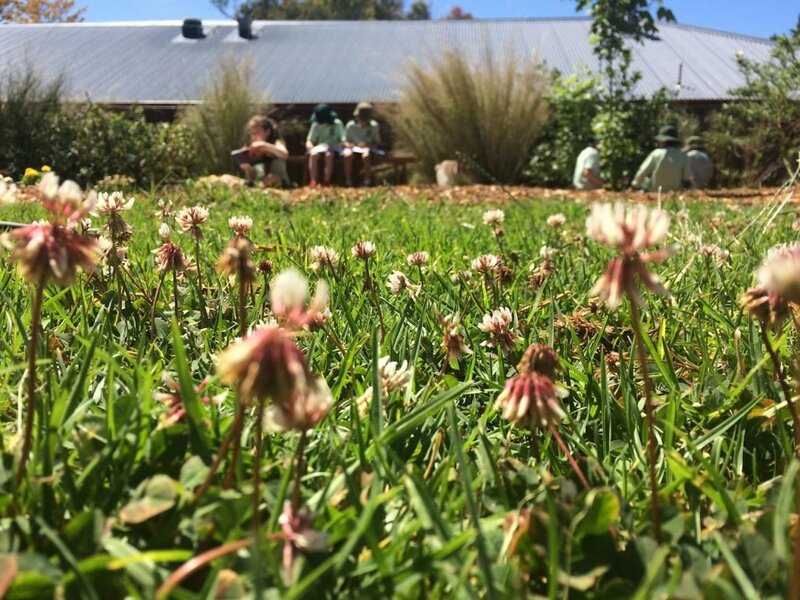 Learning Spaces – the school utilises a range of indoor and outdoor learning spaces such as corridors, makerspace rooms, studios, flexible classroom arrangements and dedicated outdoor learning areas and gardens. Devices – Mt Ousley has a longstanding 1:1 K-6 program which sees all students able to access an Apple device when it benefits their learning. 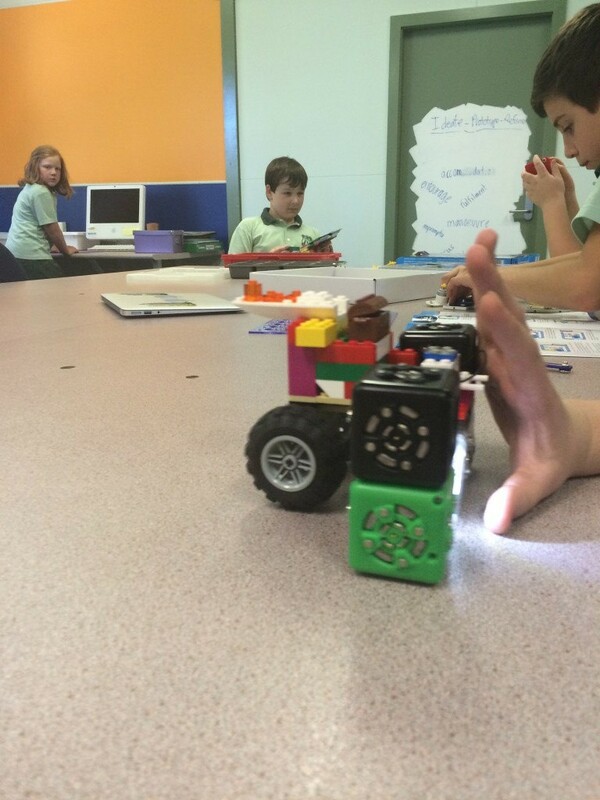 Students create content, share content and capture their learning in creative ways. They can rewind to those ‘aha’ learning moments and celebrate their success. Staffing – the staff is collaborative, collegial, committed and recruited on the basis of being the best fit for the school and its culture. The staff act as leaders in learning and regularly share back and take ownership of professional learning both in and out of the school. Forward-looking – Education is at a crossroads of delivery, the need to move away from solely broad standardised testing, predominantly whole class one size fits all instruction and text book driven learning, for example, is evident. Mt Ousley values academic success (as reflected in outstanding maths growth 2017 NAPLAN results), and it values as much, the development of the child through student voice and the explicit development of soft skills such as collaboration, reflection, empathy, resilience and critical thinking. Small group differentiated instruction, flexible choices in learning skills and content, inquiry learning, project-based learning and real-world connections are just some of the ways MOPS embraces the challenge. These are just some of key enablers of change. MOPS is a small school where big things happen and the eye of all is on the future. Building teacher capacity is always the number one driver for improving student outcomes. There is plenty of research, best known through the meta-studies of John Hattie, that education authorities across the globe have called upon to inform strategic directions and professional learning at local school levels. This year I’m team teaching hands-on science with all of our K-6 staff to build capacity. 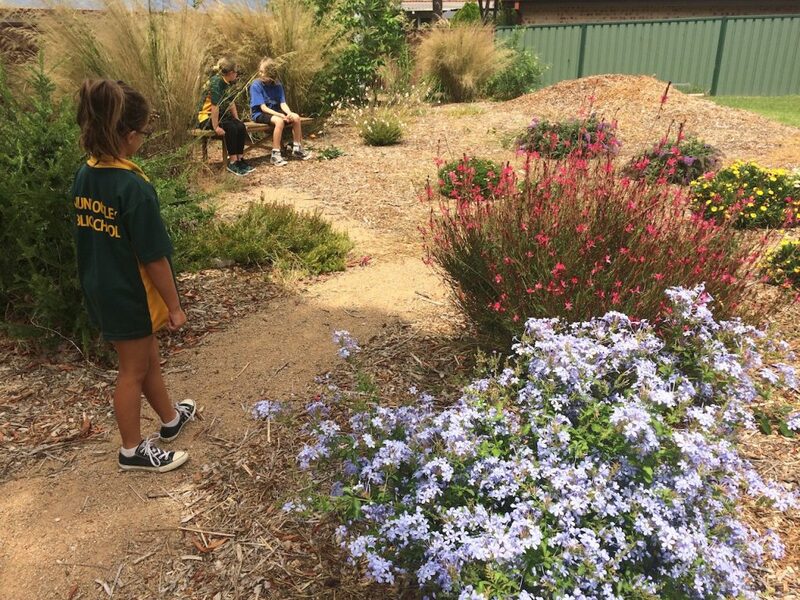 This capacity could be in developing teacher confidence with inquiry-based design and make activities, enhancing science content awareness, or management and organisational strategies that enable a respectful and challenging learning space. These lessons are over two days timetables a week apart, and importantly, have built in time for teacher reflection at the end of each session. Our leadership team has made a resource commitment to fund casual relief to enable sustained 1:1 reflection time immediately at the completion of the class session. 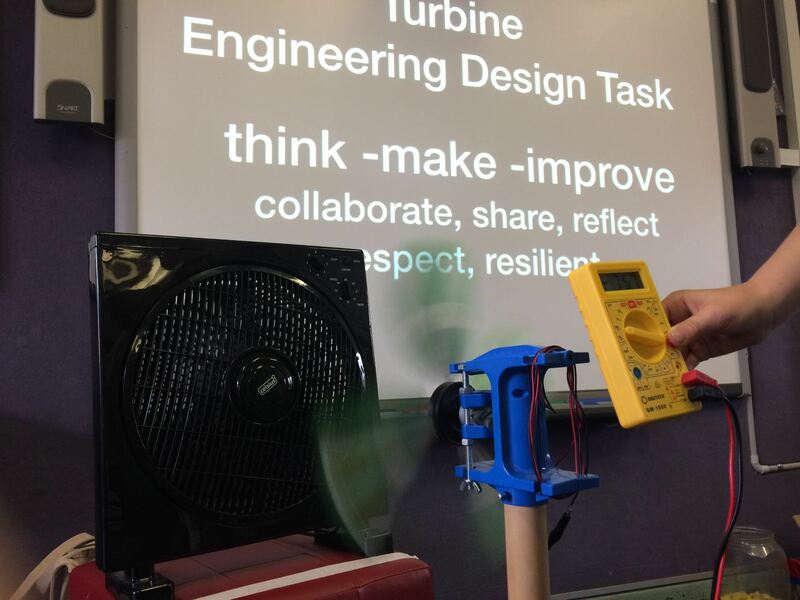 The essentials of this project are to collaboratively, in teams of two, prototype and make cardboard turbine blades that attach to a dowel and into a hub. The hub is placed onto a small generator and with a desk/floor fan provided with a ‘wind’ supply. If designed well and feathered (angles) correctly, the turbine blades spin and generate a small amount of voltage. This project uses the ‘Kidwind’ set which is well known in the US where it originated. I purchased additional kits in Australia. More info on the equipment follows below. 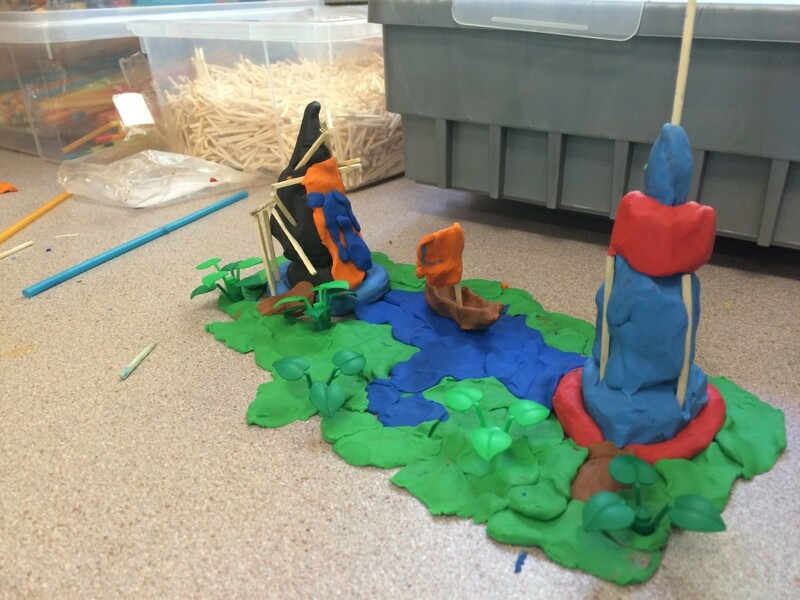 I like these examples of design and make activities, as students respond to the physical, tactile process of making. I use the TMI process of Think-Make-Improve and want the students to engage emotionally with the task, and to graft in the process of ‘hard fun’ as Seymour Papert coined it. A paper on ‘Hard Fun’, can be found here. 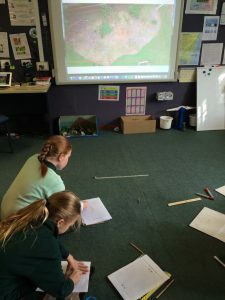 The wind turbine activity can be backwards mapped into a number of strands and outcomes in the revised NSW K-10 Science Syllabus that will be formally implemented in 2019. The working technologically strand is now more appropriately termed design and production. In terms of content, there is scope to explore material and physical world outcomes across a number of stages and especially stage two and three. This two-page pdf summarises the revised strands and outcomes. The sessions are run with a stage two (9-10yrs) age group and stage three would also be appropriate. In introducing the challenge and topic I purposely did not want to give too much away in the idea of turbine design. I had the class compare and contrast an image of an old rusty windmill and a modern turbine and discussed possible uses and operation, including the purpose of the spinning blades and possible sources of energy, both in and out, of the turbine. 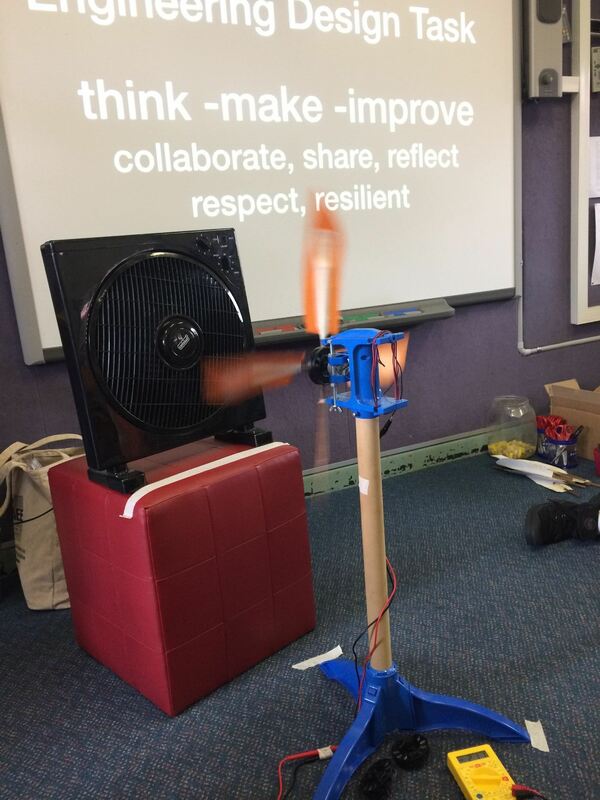 I then set the challenge of making a working turbine using dowel, cardboard, tape and hub. The first challenge was simply to get the turbine moving. In session two the challenge was to generate a consistent voltage. Then things got messy; as they should in an inquiry learning space! Lots of talking, reminders on collaboration and communication, the trialling of turbines. Cardboard and tape everywhere and a sense of student energy and focus. Groups came up to test their initial iterations – some were quite efficient and smooth from the outset, others had out of balance hubs with incorrectly spaced blades, while the blade designes themselves ranged from efficient, to too long, narrow, heavy or small. After a shared reflection and discussion of successes, challenges and misconceptions, because after all the students are scientists, mathematicians and communicators in this learning moment, the students returned to construction. 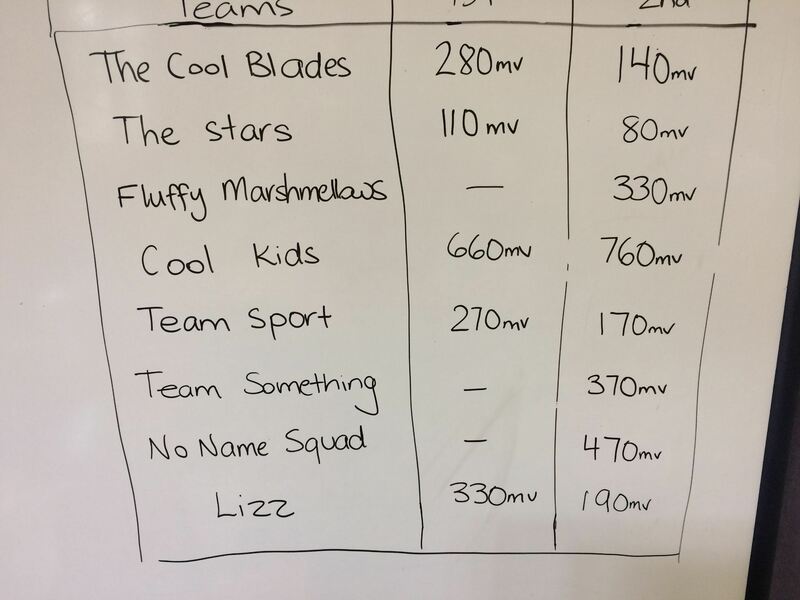 In week two we connected a multimeter to the generator to measure mV output and this added a sense of competition. Turbines that produced a higher average voltage were well balanced with similar individual blades. 3. evidence of teamwork, respect and the strong use of scientific metalanguage in group talk. During teacher reflection time we talked about the structure of the task, teacher talk used and teacher modelled language, student support and how much to give and time management; which to me is one of the biggest challenges for many teachers. The kit used was the Kidwind Basic available in Australia from https://www.scientrific.com.au/product.php?p=9877 and from Kidwind outside. While only one base kit is needed I have found it very helpful to buy multiple hubs (1 every 2/3 students) and dowels (up to five each team). This allows each team to have their own hub for the entire process. if students have to share hubs for testing, they become frustrated with having to remove their blades. The time management process is complicated. Think – Make – Improve! Jump onboard for the upcoming International Space Station EarthKAM opportunity. Middle years schooling is an ideal area to incorporate space science, geography and some juicy maths. Students upload photo requests to the remote camera onboard the ISS. The images are then made available for student investigation and analysis. A podcast with Brett McKay from Kirrawee High and myself covering contemporary science K-12. I was recently fortunate enough to have two school parents generously nominate me for the Prime Minister’s science prizes. After a lengthy process I received a phone call while driving to the snow one Friday night. On a scratchy line it was a real delight to be told that I was the primary teaching recipient. Essentially the award distills twelve or more years of actively engaging in, and for the most part enjoying, the teaching of science and associated areas in the primary school context. It was an honour to share this award with the other recipients who are all outstanding scientists and researchers; humble, dedicated and great company over the few days we spent together in Canberra. 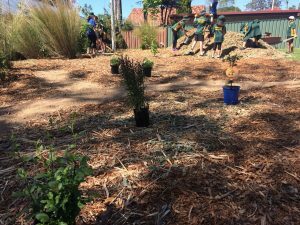 The school I work at, Mount Ousley PS, Principal Peter Holmes and the staff all deserve recognition for making the school a dynamic and vibrant place of student focused contemporary learning. There is a strong culture of trust and a supportive community. 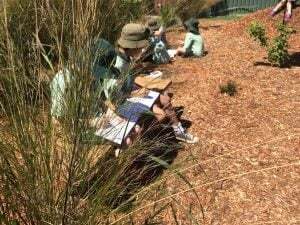 I was asked to share my thoughts on aspects of science teaching, STEM, the outdoor classroom and contemporary teaching. They are below, and whilst being a media and broadcast beginner they capture my beliefs more spontaneously than through a written post or essay. The Winston Churchill Memorial Trust recently asked me to offer four ways to get kids excited by STEM. Here are my thoughts and the link to the Trust’s website! 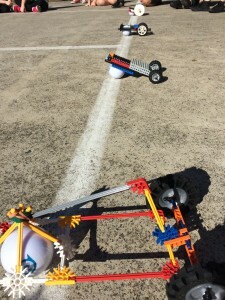 This year students from stage 3 participated in the NSW Aeronautical Velocity Challenge – a competition designed to encourage STEM skills across bottle rockets and model planes for all ages and education sectors. The winners were getting upwards of 125m in distance, which is very impressive. 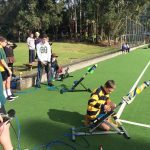 Mt Ousley PS has spent quite some time over the past few years using rocketry as a way to hook kids into loving science, maths and all things space. So it was great to join in this event. While model engine rockets have a place in my program after visits to the Honeywell Educators@Spacecamp program, I also love bottle rockets for the relative simplicity of teaching elements of design, maths and physics. With variables including fin and nose cone design, rocket mass and balance and air/water fuel balance, the opportunity arises for many iterations and tests to obtain maximum flight. Our team ran with a simple 1.2L bottle, foam core fins, a weighted nose cone and a decorative mission patch which is a terrific way to incorporate elements of human endeavour, art and symbolism. Not the most evolutionary but a sound starting point for their first competition. One of the best aspects of sharing in these days is getting to see how other teams approach the design process. Many primary and secondary schools were using 3D printers to design fins and nose cones. There were also quite a few jigs and spacers being used to carefully hot glue on the various components. Our team came away excitedly planning how they might approach future builds. When it came to what mattered – the launches, they were a mix of long and impressive flight, some mid air collapses and a few with wayward direction due to design flaws with balance, fins, weight etc. 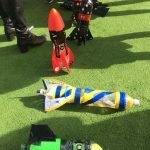 Rocketry is a truly engaging STEM activity that offers wonderful design opportunities and a visible result as to success or otherwise. Of course it’s always fun to launch, fire or blast a rocket and both teachers and students enjoy the experience. 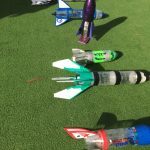 Importantly rocketry can be done safely with some basic attention to cutting and tool instruction and well considered launch and recovery procedures. Always learning! One of my favourite and most powerful ways of motivating and enthusing students into STEM elements is through design challenges. 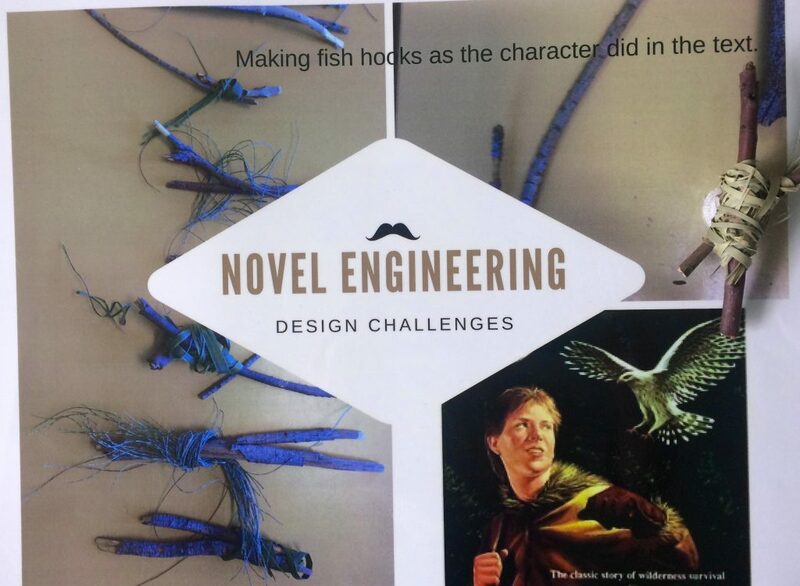 Novel Engineering out of TUFTS University have updated their resources and book list and the site now offers teachers a great opportunity to connect literature and texts to real life problem solving challenges. In having students construct solutions to challenges faced throughout texts then design and engineering opportunities can be considered, alongside responses to, and deeper engagement with various fiction texts. I am always keen to have my students undertake at least one major project based learning experience each year. 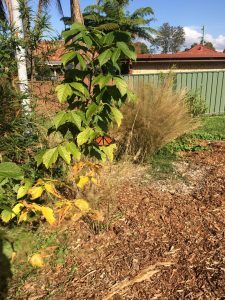 In mid 2016 I had my class work on revitalising an overgrown garden area into a ‘Butterfly Garden’. I was inspired by my visit to High Tech High in Chula Vista a few years ago where I saw a comprehensive PBL program in place including a butterfly component. 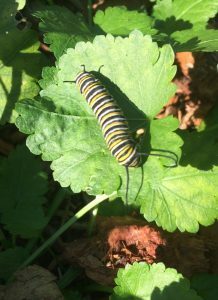 Exploring regional butterflies and appropriate feeder plants introduced a strong environmental and biodiversity perspective as students considered the ecology of a butterfly habitat. 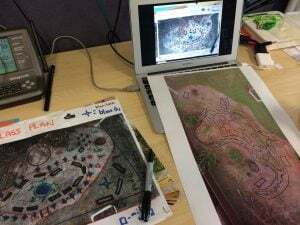 Over the course of six months it was rewarding to document and reflect on the process that covered a multitude of learning areas such as measurement, science and information reports but also the physical tasks of gardening and assembling materials. 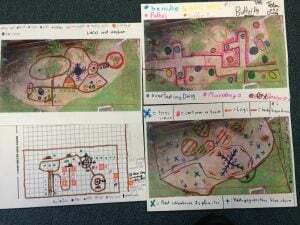 Of course PBL is a terrific way to ‘access’ this type of learning and each student was able to achieve success through various entry and exit points that they could identify with. Key Learning Areas such as mathematics, science and English and PD,H,PE came into play and offered a broad scope of learning opportunities. 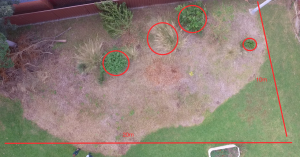 There was extensive use of measurement; both through aerial photography via a DJI Phantom Drone and scale and grid tasks that calculated the area of the garden and path. This then evolved into a volume activity as the depth of mulch and crushed concrete were calculated. 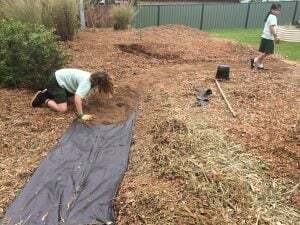 The students used websites to source local materials, cost the materials and to then ring the landscape company to place the order. 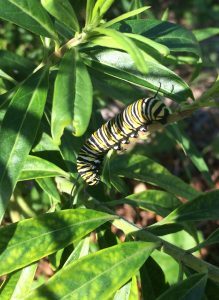 Highlights included in-depth research into local butterflies and suitable host plants. The class explored colour and the types of colour needed to attract butterflies. 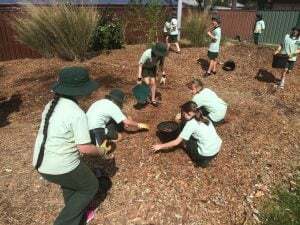 Importantly it all came together as student’s physically engaged with and enjoyed the gardening – from clearing weeds, moving barrow loads of mulch and pouring crushed aggregate to make the path. The area came to life as the seedlings and young plants were put in and began to develop. 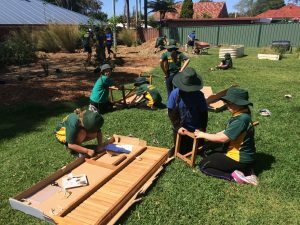 Students then followed a procedure to assemble benches so that it was a welcoming learning space. A daily watering regime was added to the class task list and deep saucers were added for birds and to provide water for butterflies. 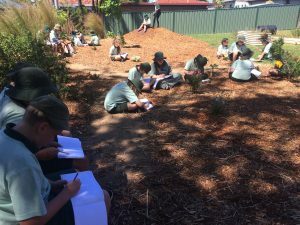 As the area established it was used for nature sketching, quiet time, reading and sensory awareness activities by the class. 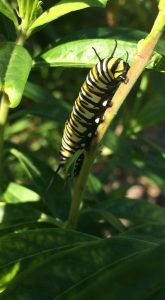 Now in early 2017 the garden is evolving as species continue to mature. Now is the time for other students and classes to take the opportunity to enjoy this special place. Those who contributed to its making remain keen to use and proud of their learning and effort. The garden six months on! 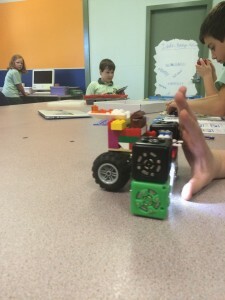 Integrated design challenges and coding with Sphero and K’nex. I love the excitement that children express when faced with what, to an adult, might be considered a ‘ho-hum’ type of learning opportunity. It serves as a reminder to respect a child’s view of the world and the thought processes attached. The examples below exemplify this thinking and are fun and challenging engineering based challenges designed to enthuse and engage students. 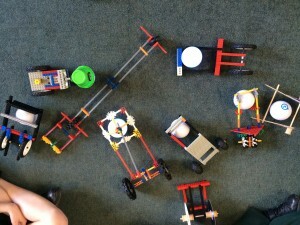 These STEM based design learning tasks resonate with years 2-6 and utilise K’NEX pieces to design and make both a bridge and chariot that are tested using a Sphero robotic ball. These are both activities that any teacher can lead and they both offer entry points that enable success for all students. 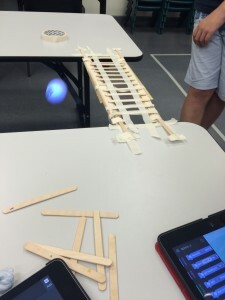 I would also add that both of these activities are detailed on the Sphero SPRK Lightning Lab education website, accessible by a free educator account. The bridge is another great design and make challenge. I always show Galloping Gertie, the Tacoma Narrows bridge disaster via Youtube to engage and hook the students into thinking about bridge design and engineering. The oohs and aahs alone are worth showing the footage. 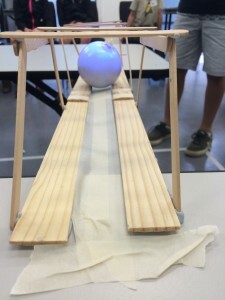 The challenge is to span a distance via a bridge that Sphero can be driven or coded to cross. I like a span around 40cm as it is longer than a ruler and results in multiple connections and more complex thinking. 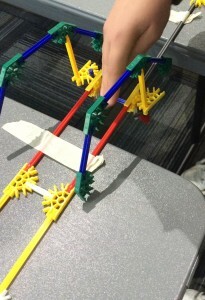 K’NEX works well for this activity as do rulers and paddle pop sticks, albeit with more masking tape, Blutac or similar. 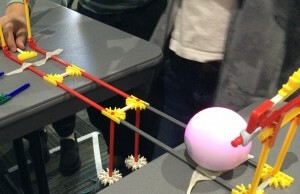 I’ve found that two or three iterations (number of designs) are often needed to deliver a structure that can support the Sphero and provide some edge guidance or rails. Be careful on smooth desks as Sphero can spin due to the lack of traction, some masking tape to rough up the surface is worthwhile. To add to the challenge, students working in groups might only be allowed to ask the teacher (engineer) one design question or students could be given a $ budget and purchase materials from the teacher as would happen in real life. 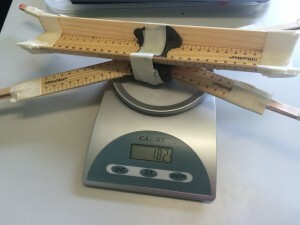 I also have students weigh their bridges and compare results. Leaning to balance weight versus strength and rigidity is an important learning point. This is a fun and somewhat tricky challenge offering opportunities for multiple iterations and trials. The challenge is to build a chariot (or harness) that a programmed Sphero acting as horse can drag over a course. K’NEX is ideal due to the range of connection options. 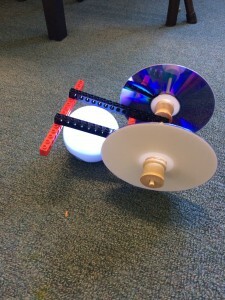 I’ve also used CDs as wheels and LEGO pieces as needed by students. 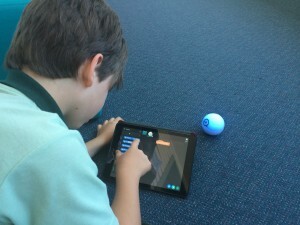 Sphero can be programmed using SPRK or Tickle app to complete a course, or for a straight line race, I’d recommend the Sphero Draw and Drive app. The design of the chariot can be simple or complex and students often find the axle/wheel combination one of the more challenging aspects to master. 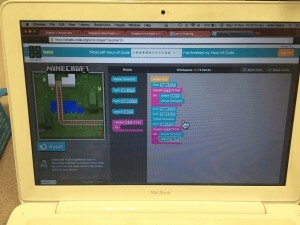 Collaboration, creativity, problem solving, reflection and resilience are evident in these tasks and strong connections to the maths syllabus and coding are embedded. design make improve – learning through serious play! The Science K-10 Syllabus is up for review and BOSTES is currently holding consultation sessions around the state. I attended the Wollongong session last week and came away impressed by the level of engaged and passionate discussion by those that participated. Session locations are here. 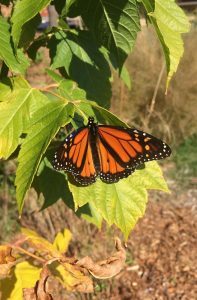 Communications: examine how living things communicate and transmit information. 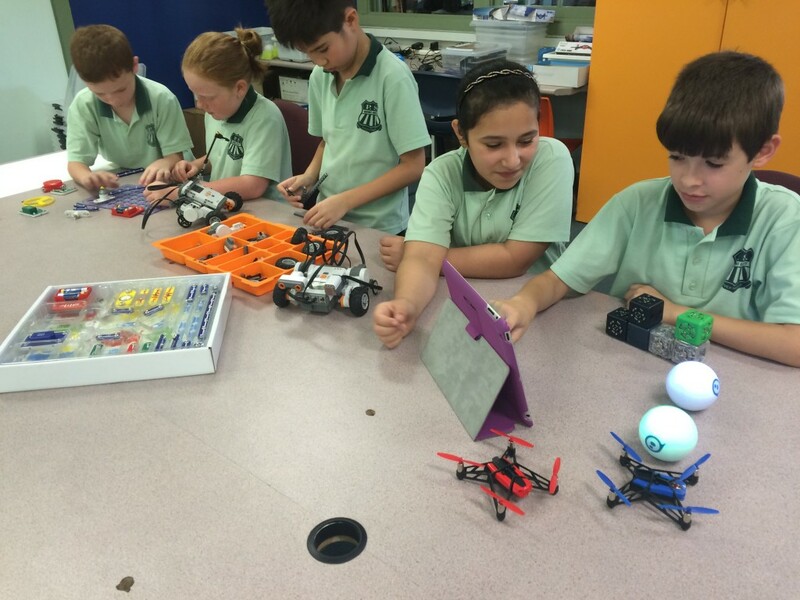 Digital systems: recognise and explore how hardware and software components interact. 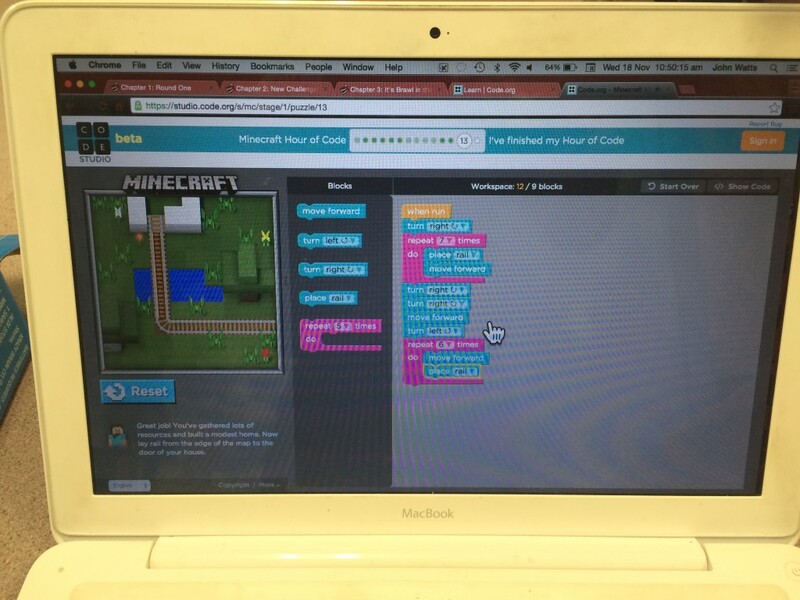 Data patterns: recognise different patterns in data including coding. Test predications by gathering data and evidence to develop explanations of events and phenomena. Data types: recognise that whole numbers are used to represent data in digital systems. Networks: explore components of common natural and digital systems and how they connect to form networks to transmit data. the inclusion on a ‘make’ component as an explicit part of the design process – Inquire, Design, Make, Evaluate. We had an interesting discussion about the order in the syllabus of value and attitudes, skills and knowledge and understandings. Skills is now separate to Knowledge and Understanding. There was general agreement that values and attitudes should be placed first on the page as instilling in students a positivity and curiosity that encourage them to value science was of significance. Without valuing science the lessons and learning experiences mean nothing and simply become another curriculum box ticking exercise. All in all I’d highly recommend teachers make the effort to contribute to syllabus development. How often do we hear staffroom rumblings about content and outcomes, continuums and rationale. This meeting was an insight into the development process and the BOSTES staff were very keen to hear and capture feedback. Coursera is offering the Exploratorium’s great Tinkering Fundamentals: A Constructionist Approach to STEM Learning online course. It starts June 27. I did this two years ago and it was without doubt one of the best professional learning experiences of the year. It offers global collaboration, hands-on learning and solid theory and insights from leading practitioners. Most project parts can be sourced locally and the skills and knowledge gained are very useful if making and tinkering is to be a focus in your school or classroom. Here is a pdf of the Make2Learn presentation. Please note that the many videos will not be playing! Feel free to contact me for further information. Thanks for sharing and dare mighty things in your classroom! InspireInnovate 2016 is on March 9 and 10 and offers a great opportunity for NSW Department of Education teachers to experience two days of contemporary best teaching practise examples shared through keynotes and workshops. 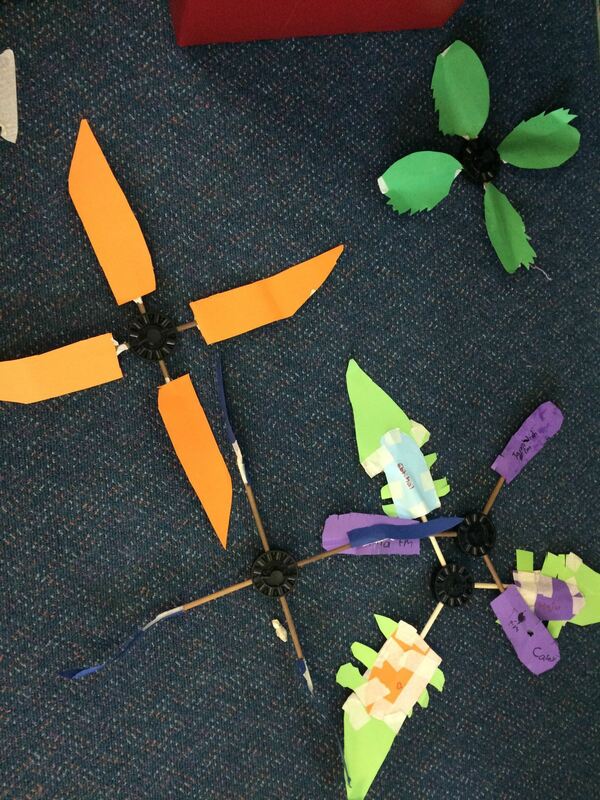 I’m running a workshop on Makerspaces and how Mt Ousley is implementing a K-6 inclusive making environment. Come along and learn through tinkering and making in a fun yet challenging environment! 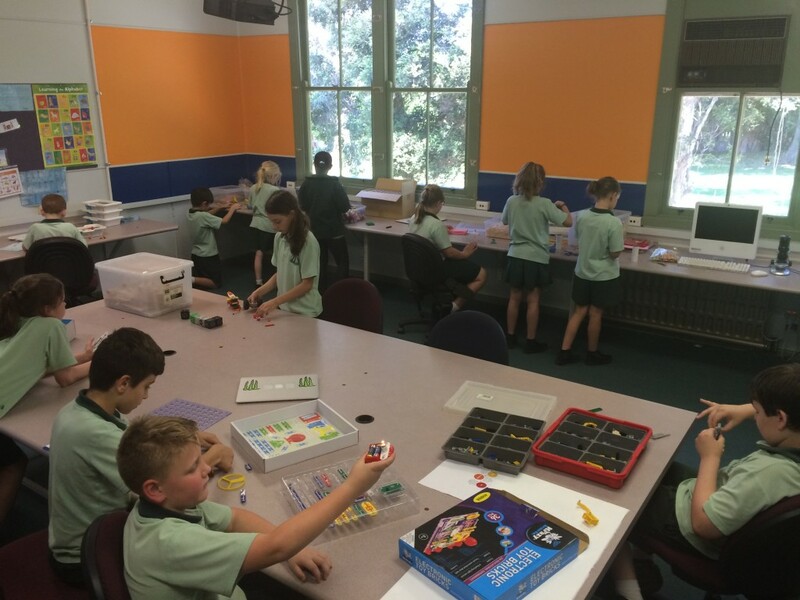 This semester we’ve been fitting out an old lab into a K-6 makerspace. For now, we have a dedicated room for children to explore, design, create, make mistakes and reflect, while in effect they learn through play. Kids can make a mess and ideate in a room designed to grow ideas and resilience. Outcomes wise (and see my previous post for the rational), making meets a range of syllabus outcomes, especially in terms of Working Scientifically through the design process and Working Mathematically aspects of communication, logical thinking and reasoning. Student reflection (English) and a growth mindset that develops resilience are also school priorities. As K-6 classes identify what suits both students and teachers we will top up kits as needed. Initially we have had great success with Sphero and Parrot mini-drone coding through Tickle app. 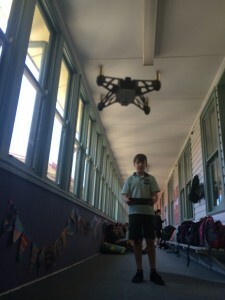 We don’t want the kids just driving and flying the drones (though it is an introduction) we want students taking on challenge problems using coordinates, angles, distance and time. Logical programming apps such as Tickle enable this to occur. From the high tech of drones to low tech, students are planning, making, testing and improving their designs. Marble runs with cardboard rolls and paddle pop sticks and simply creating plasticine modelled landscapes and objects are still a favourite. Interestingly and pleasingly, making and tinkering is already moving into classrooms with children and teachers using both high tech (Littlebits, Sphero etc) and low tech (plasticine, cardboard). As making becomes embedded in the contemporary teaching and learning cycle I’m sure we will see more making and tinkering in rooms, and it will become a norm rather than the exciting and somewhat ‘new’ type of learning often thrown into the now well out of date 21st Century learning myth. 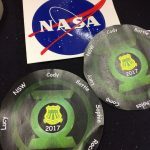 You only have to read previous posts to see how much the Honeywell Educators @ Space Academy program has influenced my STEM teaching over the past five years –from rocketry and space, LEGO NXT and EV3 robotics to innovative math lessons such as 2015 coding with Sphero and Parrot Spider mini-drones. Applications are now open for 2016. Follow the link for a possible countdown to global collaboration, life long friendships and rewarding professional learning! Enabling authentic science or learning in any subject area is a real passion of mine. I want my students, and those in other classes to partake in learning that has true meaning and purpose whenever possible. Authentic learning hooks students (and adults for that matter) because it is REAL and students rightly believe that what they are doing has both real purpose and validity. You don’t find it in worksheets, most textbooks or in any one size fits all form of teaching with a teacher blah, blah blahing at the front of the room. 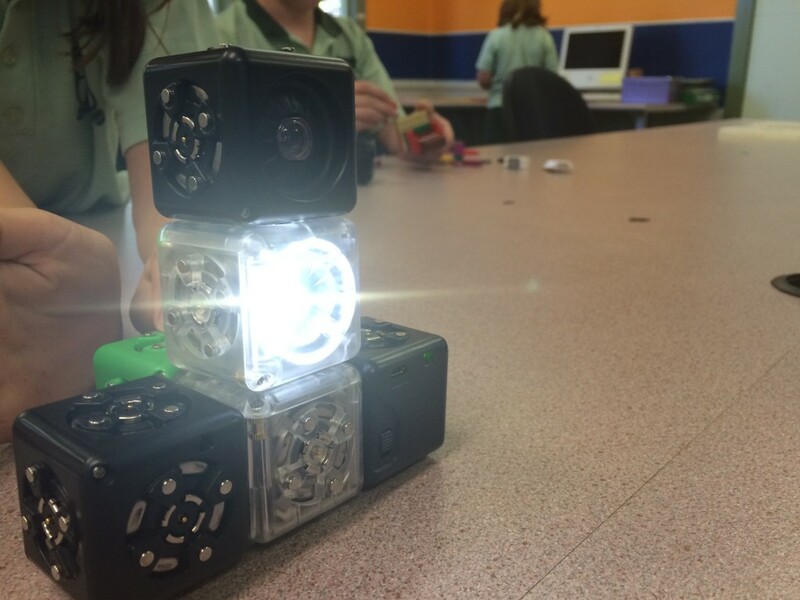 Space science and project based learning have provided my students with fun, exciting and purposeful opportunities, and one that two groups of Mt Ousley students have participated in in 2014 and 2015 is the Cubes in Space (CiS) program. CiS offers students across the globe an opportunity to send an investigation into space from NASA Langley Virginia on a sounding rocket. 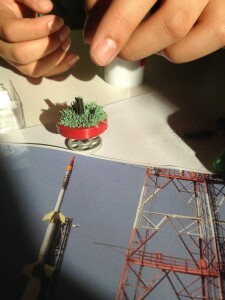 Yes… launch your idea… on a rocket with the help of NASA – very cool! 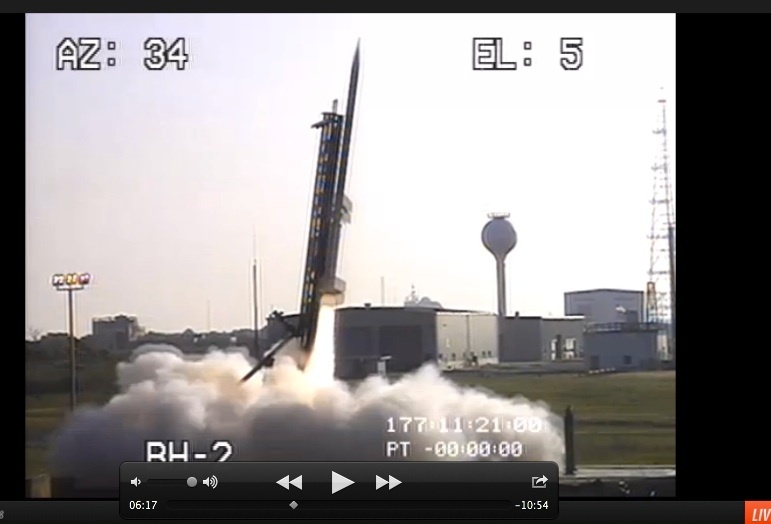 Here is the video of our 2014 launch. Cool but challenging. 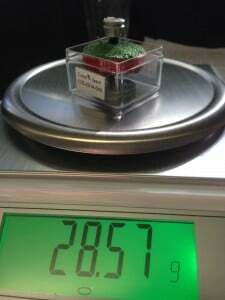 The selected investigation had to be contained in a plastic cube container measuring approximately 40mmx 40mm x 40mm and weighing 30 grams or so. Last year my first group of students submitted an idea to test the effects of magnetism in a micro-g environment. It is important to remember this is the students investigation and their research, as the teacher I’ve helped with materials and roughing out ideas but I don’t discuss their hypothesis or any misconception – that would take the fun out of it! The students covered one side of the magnet with iron filings and the other side with iron filing covered in chalk dust. The idea being to see if there was any movement of the filings due to reduced magnetism in space. So what happened? Well the school bought in to the idea and many families sat up late to watch the live launch of the Terrier rocket – exciting in its own right! The local paper got on board and shared the students’ journey. A month later the payload returned and it was opened and yes there was chalk dust everywhere – something had happened to move the dust but what? The students then realised the potential flaw as the dust could have spread during the flight over, during the shake test, during micro-g? or on return. So with a smile of the unsure, the results were inconclusive. This year another group of students chose to submit the same investigation, this time using rusted filings on one side and normal on the other. The idea being the rust would hold and a better indication of movement would be measured. Again the school bought in, the launch was watched, and the payload was launched and recovered. A month later the payload returned to our school and again the iron rust had spread throughout the case covering not only the filings but also everything else! Again, no result that could confirm or deny the students’ beliefs. That’s the great thing about science, you have to keep failing forward and I look optimistically to next year when our third group of students will have their opportunity to get hands-on and launch their idea. Important CiS is accepting applications from October 12 from schools across the globe for 2016 sounding rocket and weather balloon launch opportunities. So get your kids together and enjoy the challenges and rewards of authentic space science through the Cubes in Space program. Continuing to grow professionally and personally is an essential ingredient to maintaining enthusiasm, knowledge and currency in the teaching profession. Professional learning experiences for myself include life changing opportunities such as a Churchill Fellowship, Honeywell Educators@Spacecamp and Apple Distinguished Educator conferences, to earthy, yet as valuable, TeachMeets and Edcamps that offer valuable local networking and professional learning opportunities. ‘Thanks for sharing’ is so great to hear! The Space Foundation Teacher Liaison program offers K-12 and other educators with a passion for space science and education, the opportunity to share, collaborate and network under the umbrella of The Space Foundation. Applications are now open and if you can demonstrate evidence of student engagement, community outreach, teacher education and a Space Foundation connection (not difficult) then you might well join the 2015/16 intake. Applications close December 4 2015.